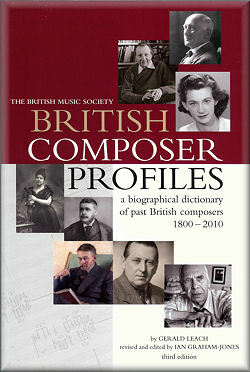 British Composer Profiles is a biographical dictionary of past British composers living between 1800 and 2010. Gerald Leach's work on two previous editions in the 1980s was recognised as a valuable resource, and the British Music Society has now published an expanded third edition revised, enlarged and edited by Ian Graham-Jones. The Chronology and Appendices have also been enlarged as further reference, and a new Introduction by Lewis Foreman offers useful insight into the background of the state of British music during the period covered. British Composer Profiles costs £12.50 to non-members of the BMS, plus postage & packing (within the UK £2.50, airmail within the EU£6, airmail outside Europe £10).